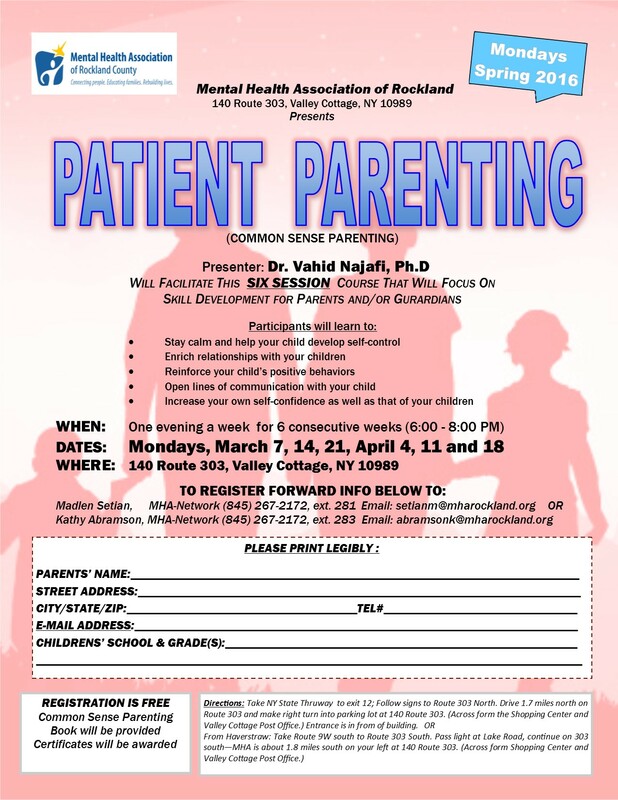 On Monday evening, March 7th, 2016 the Mental Health Association of Rockland County, Inc., will begin a 6-week Patient Parenting class to enhance parenting skills and techniques. The Course will be held on Thursday evenings at the MHA Center at 140 Route 303, Valley Cottage, NY 10989. Class dates are March 7, 14, 21 and April 4, 11, 18, 2016. Hours are 6:00 PM – 8:00 PM. Patient Parenting is a practical, skill-based parenting program that can be applied to every family. The program’s logical strategies and easy-to-learn techniques address issues of communication, discipline, decision making, relationships, self-control and school success. Continuing to learn new skills and strategies is a fundamental part of good parenting. The proactive skills and techniques taught in Patient Parenting classes have helped parents from diverse backgrounds create healthy family relationships that foster safety and well-being at home, in school and in the community. The course is taught by a licensed child/adolescent psychologist with over 30 years experience in the field, and over 15 years in conducting parent training programs to enhance parenting skills. Patient Parenting classes are free; space is limited. To register please contact Madlen Setian (845) 267-2172, ext. 281 or Kathy Abramson at ext. 278. MHA is the proud recipient of Rockland Business Association’s 2016 Pinnacle Award! MHA is the proud recipient of Rockland Business Association’s 2016 Pinnacle Award for Non-Profit of the Year, exhibiting excellence in service to the Rockland Community! Members of the Rockland Business Association nominated MHA for this esteemed honor based on our accomplishments and efforts. MHA has a 65 year history of providing outstanding services to more than 50,000 Rockland County residents since its inception in 1951. We are grateful for the support of the Rockland community and will continue to provide exemplary service as we carry out our mission of Connecting People, Educating Families and Rebuilding Lives.